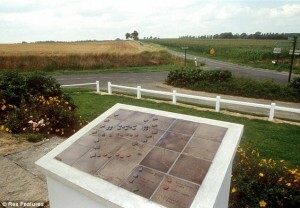 The 600th anniversary of one of the most famous British military victories is being celebrated this month. 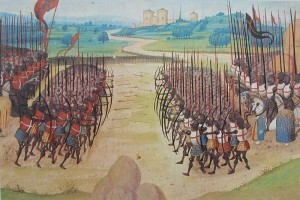 The actual date is the 25th October 1415, the event the Battle of Agincourt when Henry V, with an outnumbered and outclassed army, defeated the mighty French troops with astonishingly small loss of British lives. 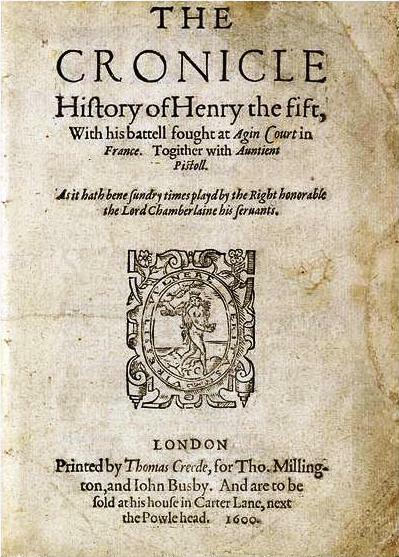 The battle became legendary, chroniclers writing down and embroidering the facts and Henry V becoming renowned as the greatest and most heroic of monarchs. 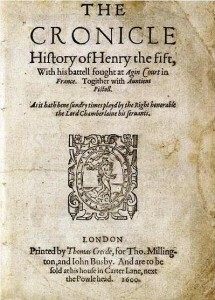 Shakespeare’s play has ensured that the circumstances surrounding the battle are well-known, though still controversial. The anniversary of Agincourt is being marked all round the country, the Agincourt 600 website coordinating events that are happening over a period of several weeks. I’m writing this two weeks before the day itself because so much will be happening in advance. Here are a few of the astonishing array of things being lined up all over the country (for more information see the Agincourt 600 website): Starting in Wales, there will be an exhibition relating to the Welsh input to the battle at Brecon Castle, and on the day itself a talk by Juliet Barker at Monmouth Museum, while at Caldicot Castle in Monmouthshire there is to be an Agincourt Banquet and a weekend of re-enactments including archery displays, knights in full armour, music and dancing. In London there will be a lecture at the Society of Antiquaries on 27 October and an exhibition at the Royal Armouries. This is the blog post from the Royal Armouries on Shakespeare’s interpretation of the history. The Wallace Collection is putting on a display entitled The Sinews of War: Arms and Armour from the Age of Agincourt, featuring weapons and armour from the early 15th century, as well as rare books that explore the way the battle has been remembered over the centuries. Further north, there is to be an all-female production of the play in York. In Stratford-upon-Avon the RSC’s current production of the play will be broadcast live to cinemas on 21 October. Also in Stratford, the Orchestra of the Swan are giving a concert on 20 October featuring William Walton’s music for Laurence Olivier’s 1943 film. In Bidford-on-Avon, just a few miles from Stratford, they are making a weekend of it with a lecture on Friday 23rd by Professor John Buckley on the Agincourt campaign followed on the 25th itself by a concert by English Serenata, with the English Serenata singers and RSC actor Sam Alexander. This too will feature Walton’s music and readings from Henry V as well as extracts from Richard III and As You Like It. Moving back south again, on 19 October Curator Roy Porter will lead a tour of Porchester Castle where Henry V prepared for the campaign in France, under the title Agincourt and the Southampton Plot. There will also be a talk at Canterbury Cathedral, an Agincourt evening at Highclere village hall and a gala ball at Titchfield. It’s great to see so much activity from organisations of all sizes. 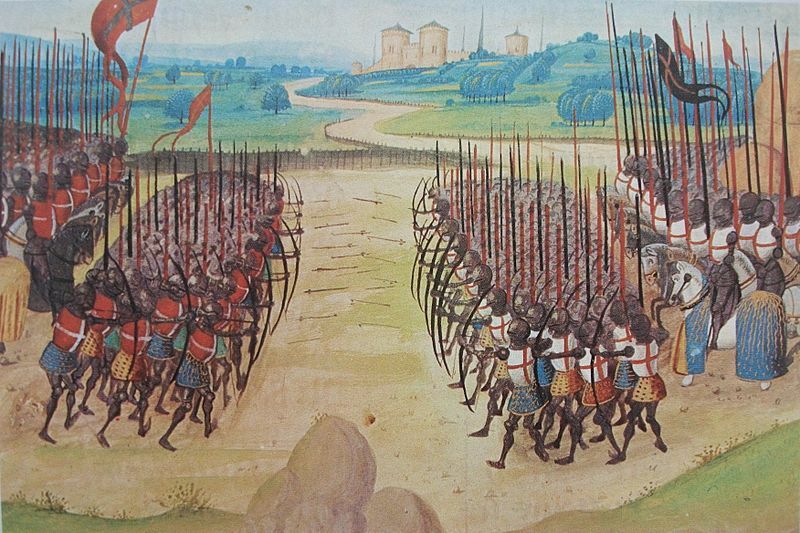 Many of the events highlight the gap between the facts and the reality, and if you want to find out more sign up for FutureLearn’s two-week free Massive Open Online Course Agincourt-Myth and Reality, coming from the University of Southampton and beginning on 19 October. 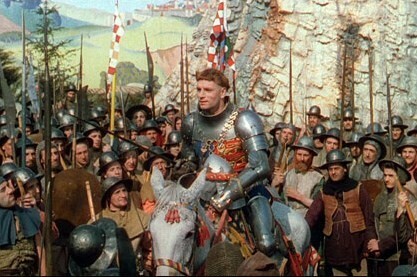 This entry was posted in Legacy, Plays and Poems and tagged Agincourt, anniversary, battle, Henry V, Laurence Olivier, war, William Walton. Bookmark the permalink. Thanks very much for all that information – very useful. Here we are……Leslie Banks – a onetime Bensonian Player – far better as Chorus than overblown Jacobi in 1989. As many know – Olivier’s movie was made in 1944 to beef up morale during WWII. Around the same time, G.M. Trevelyan (born in Stratford at Welcome House now a hotel) one of the greatest of Cambridge University’s long line of great historians – published ‘English Social History’, a book commissioned with a similar patriotic aims. How wonderful, I didn’t realize that Leslie Banks had played with the Benson company. Many thanks for that little gem of information. Just today it has been announced that archaeologists may have found one of Henry’s ships – the Holy Ghost- lying in the mud of a river.